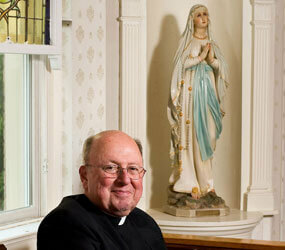 Monsignor F. Dennis Tinder died Dec. 4, days after his retirement as pastor of Immaculate Conception Parish in Towson. Tinder, 67, grew up in the parish, which he had led the last nine years. He had previously served at St. Pius X in Rodgers Forge, St. Joseph in Fullerton and St. Jane Frances de Chantal in Riviera Beach. He had also held administrative positions with the Archdiocese of Baltimore. “The death of Monsignor Tinder is a devastating blow to the Immaculate Conception community and an immeasurable loss for our entire archdiocese,” Archbishop Edwin F. O’Brien said. “At all four parishes where he served, as well as in his various administrative positions, Monsignor Tinder served always with a joyful heart and with great love for the Lord and those he served. “To Father Michael Foppiano, associate pastor under Monsignor Tinder, and the faithful of Immaculate Conception Parish, I offer my supportive prayers and that of your sisters and brothers of the entire Archdiocese of Baltimore. Monsignor Tinder studied at St. Charles College, a former minor seminary in Catonsville, then Mount St. Mary’s Seminary and University in Emmitsburg. He was ordained in 1968. A Nov. 19 article in The Catholic Review regarding his retirement reported that Monsignor Tinder was suffering from a neuromuscular disease.